FAYETTEVILLE, Ark. (CN) – Former reality TV star Josh Duggar, of “19 Kids and Counting,” claims that In Touch Weekly invaded his privacy by publishing investigative reports from the 2006 child molestation case his sisters made against him, which Arkansas police promised would be kept confidential. Duggar’s federal lawsuit mirrors the one four of his younger sisters filed in May against the same defendants: the City of Springdale, Washington County, the Arkansas Department of Human Services, five Springdale officials or former officials, and Bauer Media Group. Duggar, 29, says in his Thursday lawsuit that he was underage when Springdale police began investigating years-old allegations that he had sexually assaulted four of his sisters, in 2002 and 2003. He claims that investigators with Arkansas State Police and Washington County promised him and his parents that any statements they made would remain confidential under Arkansas law and would not be disclosed to the public. The Arkansas State Police are not named as defendants, though former Springdale Police Chief Kathy O’Kelley is, as is Springdale City Attorney Ernest Cate. The statute of limitations barred charges from being filed against Duggar, who was the first of the “19 Kids and Counting” celebrated on the TLC show. Jim Bob and Michelle Duggar, the family’s Baptist parents from the small Ozark town of Tontitown, famously do not believe in birth control. 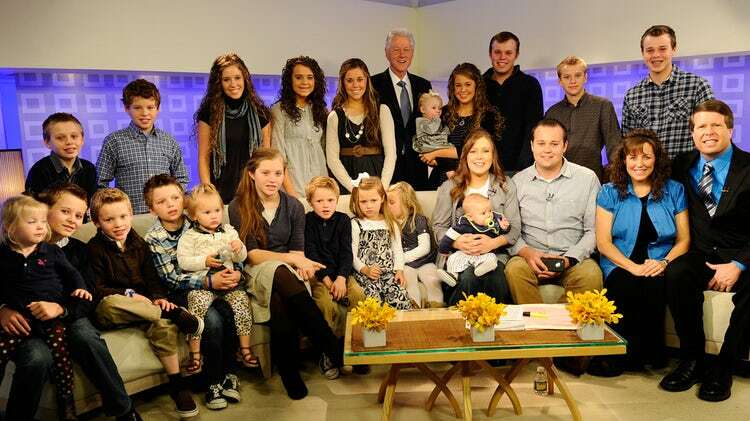 All of their 19 children have names that begin with J.
Duggar claims in his lawsuit that Springdale officials responded to In Touch Weekly’s May 2015 Freedom of Information Act request by “hastily and recklessly” authorizing release of the police offense and incident reports. He says the poorly redacted reports contain identifying information including his and both of his parents’ names, the family’s address, and clearly identified one of the alleged victims as his then-5-year-old sister. Duggar claims that as a result of being called a perpetrator of sexual misconduct, he was forced into seclusion for fear of his safety, had to hire round-the-clock security due to threats he and his family received, and endured harsh and unwanted public scrutiny for experiences that occurred when he was underage. “Plaintiff continues to be emotionally upset and humiliated by the disclosure of his identity as a juvenile offender and the intimate details of those acts, including the fact that his siblings were the alleged victims,” Duggar says in his complaint. TLC canceled “19 Kids and Counting” in July 2015, two months after the magazine began publishing its stories. Days after the show’s cancellation, a hack of the cheating website Ashley Madison revealed that Josh Duggar had been a member since 2013. Springdale is seeking dismissal of virtually identical claims the Duggar sisters filed in May. In its June 29 brief in support of a motion to dismiss, the city claims that O’Kelley and Cate are entitled to qualified immunity, that police officers made no promises of confidentiality, and that city officials did not violate the Duggars’ constitutional rights. “The truly egregious conduct at issue was that of Josh Duggar and not the Springdale defendants,” the city says in its motion to dismiss the sisters’ case. Josh Duggar seeks punitive damages for invasion of privacy, outrage, due process violations and emotional, mental and psychological distress. He is represented by Travis Story of Fayetteville. Springdale spokeswoman Melissa Reeves said in a statement to Courthouse News on Friday that Duggar’s claims are false and without merit. She said that the city made the Duggar family award of the FOIA request and kept them regularly informed of its status before releasing the reports. “It is unfortunate that now, at this late date, the plaintiff has chosen to file a misguided lawsuit against dedicated public servants and seeking damages from public tax dollars,” Reeves said. Bauer Publishing Group publicist Lindsay Fariello did not respond to an email request for comment after office hours Thursday.